Northern Iraq is a different proposition from the rest of the country. Where Arabs dominate Iraq, Kurds dominate the North. Where the terrain of Iraq is smooth and flat, the North is rough and mountainous. Where Iraq is restive, the North is calm. Karkūk, the site of one of the largest oil fields in the world and an ethnically diverse city composed of Arabs, Kurds, Assyrians and Turkomans represents the limit of the de facto authority of the central government in Baghdad. The last checkpoint before entering the city of Karkūk is controlled by men wearing Iraqi army and interior ministry insignia. The checkpoints to the north are controlled by men wearing the insignia of the peshmerga – Kurdish fighters that have been battling and dying for Kurdish independence since the breakup of the Ottoman Empire following the end of the Great War. We joined up with a tour group to spend 5 days exploring Northern Iraq. 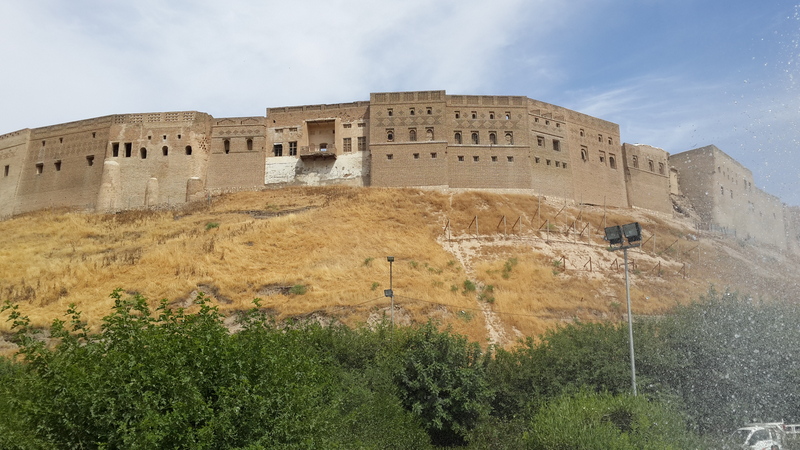 The journey from Baghdad to Erbil, the cultural and political capital of this autonomous enclave and one of the oldest continually inhabited cities in the world, is about 350km long. This being Iraq, what should be a leisurely 4 hour drive turned into a tense and overwrought 12 hour mission. The most notable delay occurred a little over an hour after leaving Baghdad. An Army Humvee rolled up and blocked the road with a handful of heavily armed soldiers standing guard and keeping traffic at bay. People exited their vehicles and stood in the heat to converse. The crowds steadily grew as those stuck further back drove off road to get closer to the source of the delay. There was some sort of explosive device further up the road. The Army had to secure the area and safely detonate the bomb before traffic could resume, an undertaking which lasted over 3 hours. Further delays were due to the more stringent scrutiny administered by the peshmerga to ensure that the areas under their control are spared the senseless violence gripping the remainder of the country.